From 5-9 September 2016, police officers from the National Police of Ukraine (NPU) and the Ministry of Internal Affairs (MoIA) visited Poland for a study trip organised by the EU Advisory Mission Ukraine (EUAM). Establishing an effective education and HR management system based on EU experience was at the centre of the programme. Among the participants were HR managers from the NPU and MoIA, representatives from Professional Training and International Cooperation Departments and the National Academy of Internal Affairs of Ukraine. 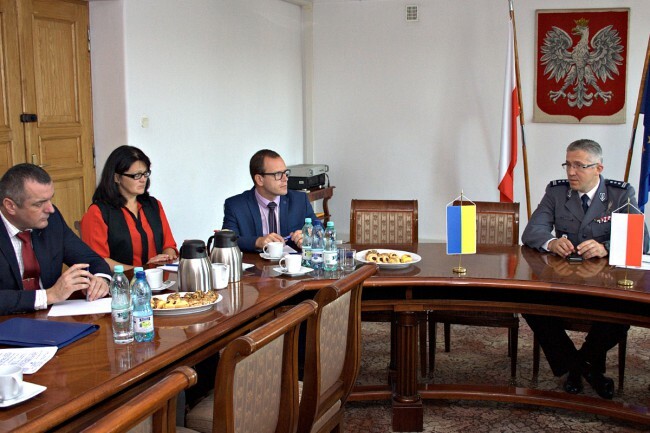 The Ukrainian delegation were given an opportunity to share experiences with their colleagues in the Ministry of Interior and Administration of Poland got acquainted with its structure and functions. Unlike in Ukraine, this Ministry is a civilian agency, which oversees the work of Law Enforcement bodies. The delegation also visited National Police of Poland who provided information on recruitment and career development. Financing and the allocation of budgetary resources were topics closely followed by the Ukrainian officers. The Police Training Centre in Legionowo provided information about their training courses with the main focus on basic training for police officers and special courses. The Ukrainian delegation visited a shooting range, a driving range, forensic laboratories as well as the International Training Centre for Combating Clandestine Laboratories, which is unique in Europe. Participants of the visit had a chance to observe some trainings, visit dormitories as well as try food prepared for students. In Szczytno, the Higher Police School delivered a presentation on its activities. Besides that, Ukrainian officers had a chance to try trainings sessions in the simulation laboratory of police actions in crisis situations. The delegation also visited the forensic laboratories in Szczytno. Rafal Zamrzycki, the EUAM Senior Advisor on Vetting: “At this stage of changes that are taking place in the Ukrainian Police and the Ministry of Interior, exchange of experience with colleagues from the neighbouring country like Poland, is crucial. Such study visits are a good opportunity to get the most lessons that colleagues have learned”. By the end of the visit, the Higher Police School in Szczytno and the National Academy of Internal Affairs of Ukraine declared readiness for future cooperation and possibility to provide support for Ukraine.